I don’t know how special the falling snowflakes are to you but for me, that whole moment is extremely thrilling. I love witnessing and capturing how the whole colored town gets painted in white color in minutes. It looks so heavenly. I can sit and gaze at the snowfall for hours. They seem like cotton candies of various sizes. Anyways, if you too feel the same and want to experience the live snowfall, then January and February are the right months to rush to satisfy your eyes and soul. 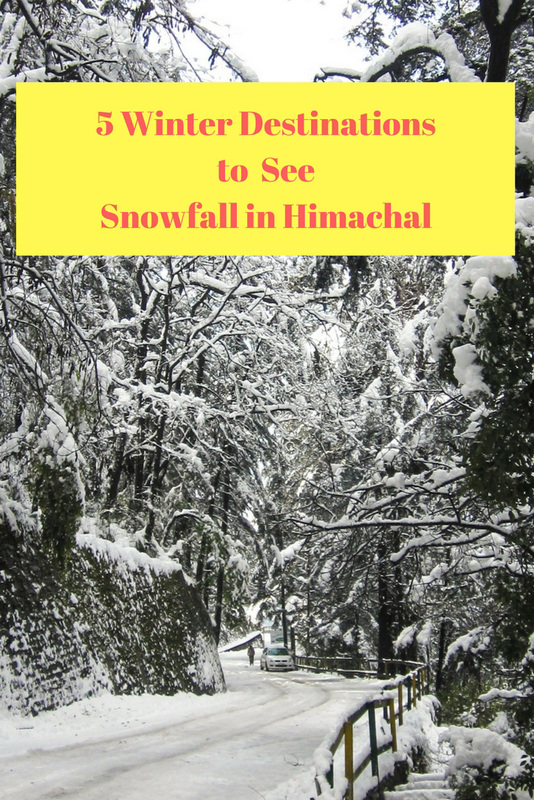 And here are the five winter destinations to experience snowfall in Himachal. 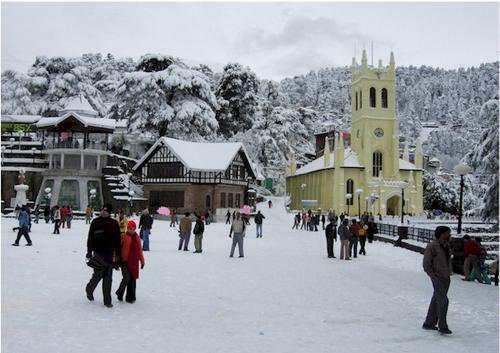 Shimla, the queen of Himachal is a colonial town. In winters the slanting roofs of buildings get covered in snow sheets and dancing deodars around it give a Paradise feel. The whole scene is a perfect postcard picture. 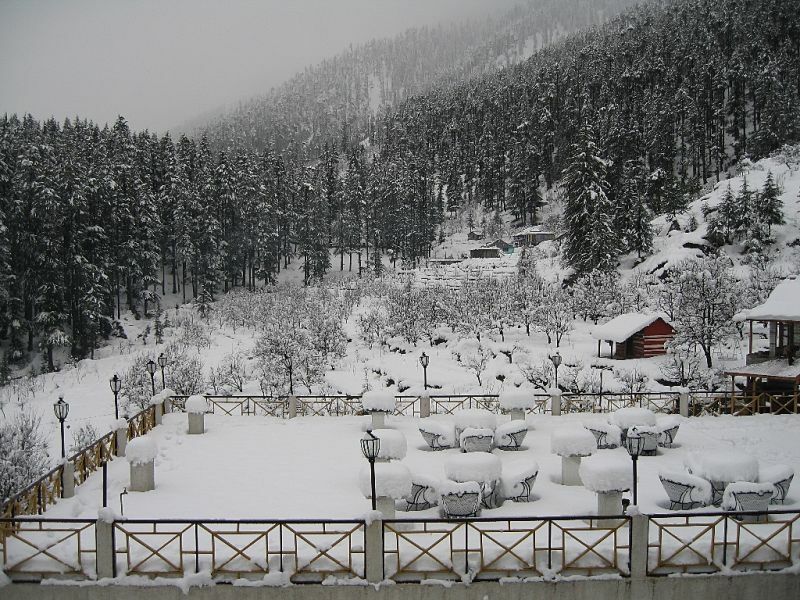 Kufri a small hill town lies 18 km ahead and it is a famous skiing hotspot in winters. Chail known for its quietness and birds lies further 27 km to Kufri. In winters during snowfall, there is only snow, greenery and the misty surroundings engulfing the whole environment. The Manali town is surrounded by snow clad mountains on one side and Beas River on the other It is beautiful during all the months and imagines how beautiful it will be in extreme winters (December, January, and February) when there is fresh snow with a fluffy texture. Everything gets white, more beautiful, and picturesque. The landscapes get more enhanced and are clearly demarcated. The Solang valley lies 14 km ahead of Manali and is famous among tourists and travelers for ice skating, skiing, and zorbing. The cable car from Solang valley is a beautiful ride and it takes you to the snow point. Difficulties you may face during snowfall in Himachal: Water shortage, power trips, roadblocks, traffic jams and high chances of slipping on ice. So carry snowshoes or you can rent it from there. Haripur Dhar is a small town situated on a ridge overlooking deep valley in Sirmour district of Himachal Pradesh. It is quiet, serene and not a common tourist destination. The temperature during summers in Haripur Dhar varies from 0 to 5 degree Celsius and in winters it is completely snowing. There are awesome views of snow clad mountains from the ridge top. The Mcleodganj located at an altitude of 1700 meters is a home to Dalai Lamas and has a jumbled mix of shops, restaurants, hotels, and cafes strewn along the steep winding alleyway. It lies in the Dauladhar range, 10 km ahead of Dharamshala. 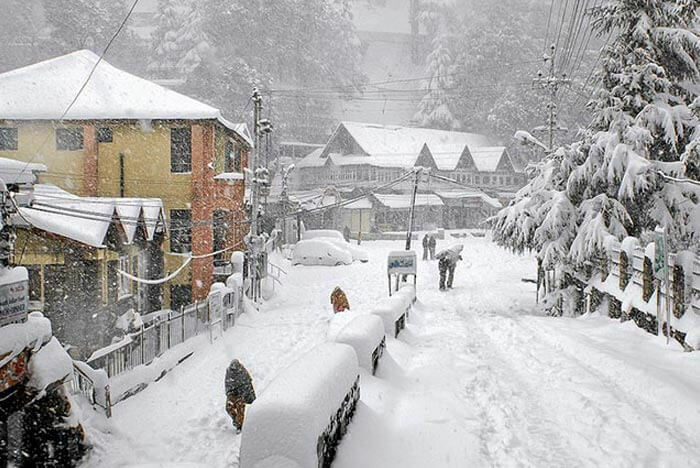 Mcleodganj receives a good amount of snowfall in Himachal during winters in January and February. The environment is chilling with the cold breeze and is flocked by couples especially honeymooners. The whole place is blessed, romantic and a tranquilizer in itself, quite different from summers. Dalhousie, a quiet colonial Hill station is named after British General Lord Dalhousie. 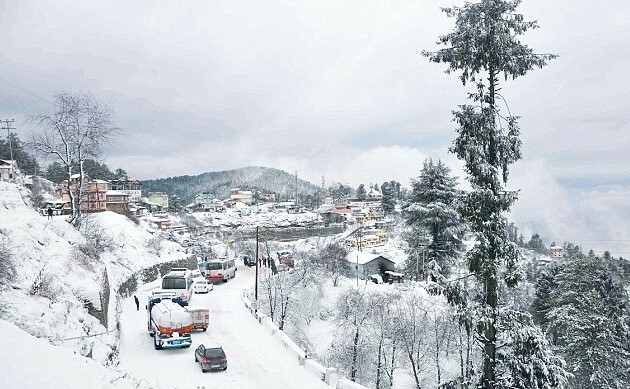 It is a tourist destination throughout all seasons but in winters during January and February snowfall adds an extra charm and cream to its picturesque landscapes. The white sheet makes the combination of white and green nature more enchanting and beautiful. 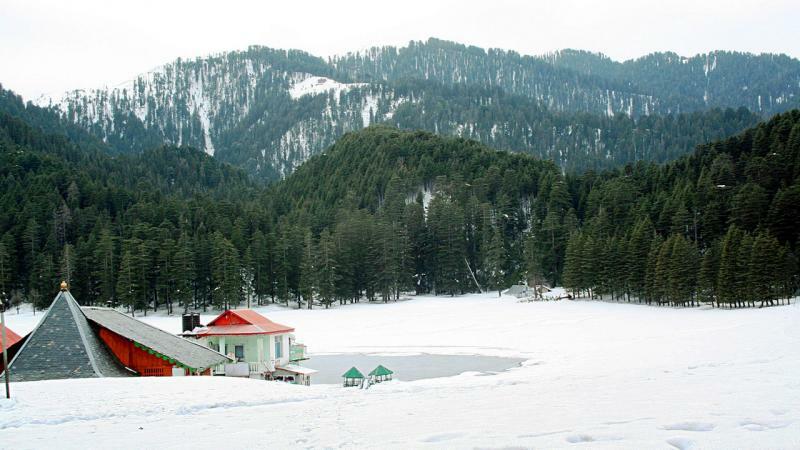 The Khajjiar town lies 21 km from Dalhousie and is known as Switzerland of India. In winters its huge green meadows get covered with snow sheets and pine trees in backdrop look so poetic and it is like a dream come true. Most important is – Don’t panic if you are struck. Calm down and think how to handle the situation. 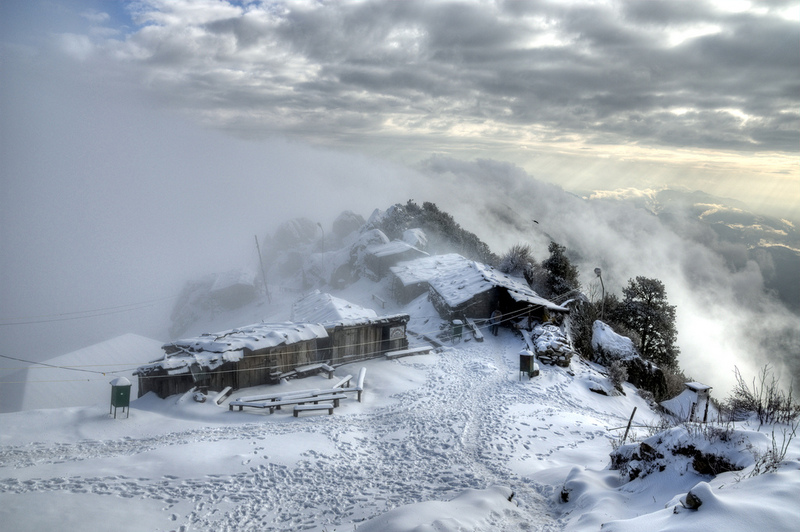 You can also check the places to experience snowfall in Uttarakhand near Delhi. These places are so pretty! I’d love to visit them someday! Yeah whole Himachal is beautiful with its amazing landscapes and mountains. All of those places look amazing, I’d like to go to all of them! They are awesome and must visit. Thanks Anu for bringing us yet another great blog post. Plenty of useful information here, the photo of Manali in Thiruvallur district looks lovely! Gorgeous winter photos. I love how you give the directions to find these places. Well done! Beautiful places! They are an my ‘must visit’ list! Some people think winter isn’t beautiful. From your photos just goes to show how beautiful winter is and how much fun it can be. Yup Candy. Its freaking cold but beautiful too. So, worth visiting in winters. what a beautiful town! your images are stunning. We never ever get snow and I am so jealous of those who do! Plan a trip to North India during winters. you will get to see plenty of places covered in white and I am sure you will be thrilled to see them. Stunning scenery! The tips at the end were really helpful too! It’s surprising how much snow Northern India gets – it looks like it’s in Canada (where I live)! I’ve been to McLeod-Ganj but it was in December and there was no snow at all. The weather was actually very sunny and warm. I don’t know if that was unusual but I was happy not to be stuck in snow as we weren’t prepared for it at all. North India usually get lots of snow in December end, January and February. This year it is bit late and happened after first week of January. But after snowfall everything looks awesome. Next time when you are prepared, experience the winters and snowfall in India. As someone who grew up in Pennsylvania, I hate snow. However, your pictures make me hate it a little bit less! I understand.. Life gets tough after snowfall but it is beautiful for travelers and tourists. Everything looks so much more beautiful under a sheet of snow! All these places are so beautiful! They look like places out of fairytales. I’m not a huge fan of the snow as in the UK it just stops everything, but this is all beautiful! I love Haripur Dhar, it looks like a Christmas perfect picture card, although I think I’d have to wrap up warm to visit!